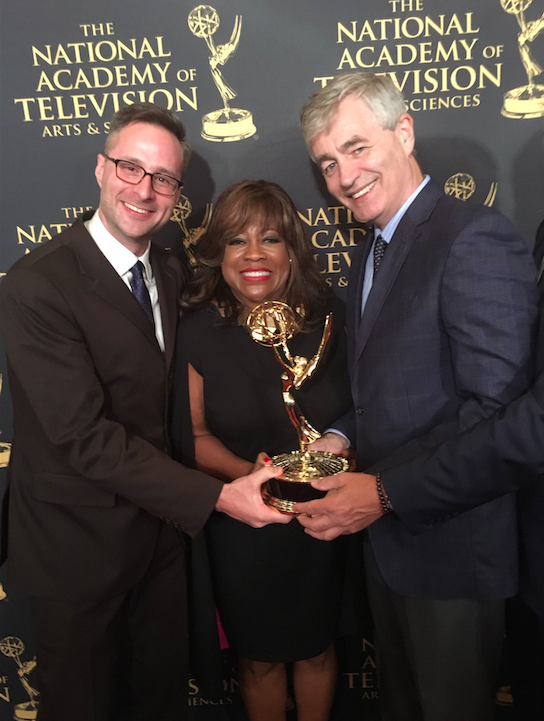 Kartemquin Films won two Emmy Awards tonight at the 37th News and Documentary Emmys in New York City. 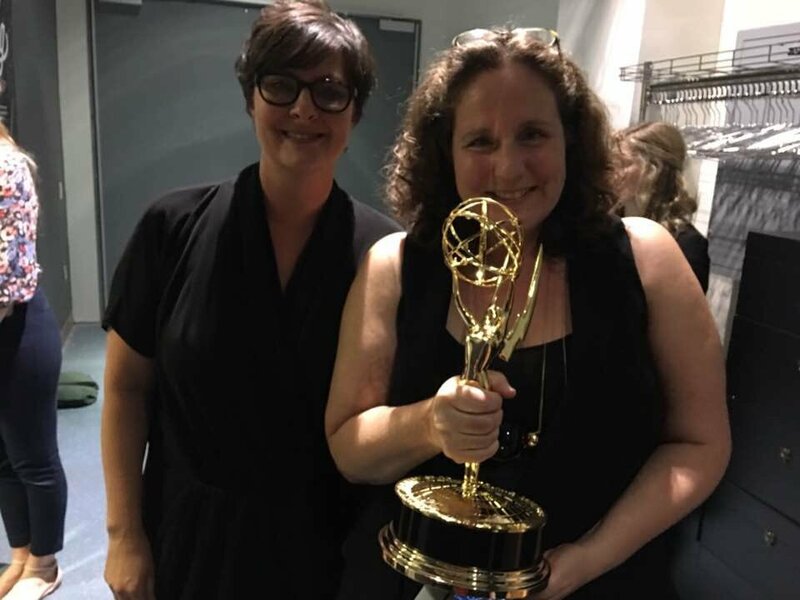 The Homestretch, directed and produced by Kirsten Kelly and Anne de Mare, won the Emmy Award for Outstanding Business and Economic Reporting - Long Form. Life Itself won Outstanding Editing: Documentary And Long Form for the film's Editors Steve James and David E. Simpson. In her acceptance speech, The Homestretch Director/Producer Kirsten Kelly said, "Our biggest thanks goes to our subjects: Roque, Kasey, Anthony, and Maria, who bravely shared their struggles and their triumphs with us over four years." She shares congratulates with Executive Producers Sally Jo Fifer, Justine Nagan, Gordon Quinn, Andrew Schwertfeger and Lois Vossen and Editor/co-writer Leslie Simmer, along with the many other members of the filmmaking team and community partners who helped this film get made and seen, including the John D. and Catherine T. MacArthur Foundation, Sundance Institute, Independent Lens | PBS, ITVS, Teen Living Programs, The Night Ministry, American Graduate, Corporation for Public Broadcasting, National Alliance to End Homelessness, Bullfrog Films, Chicken & Egg Pictures, Good Pitch Chicago, National Network For Youth, True Colors Fund, National Runaway Safeline, Chicago Public Schools, Chicago Coalition for the Homeless, Picture Motion, and the Fledgling Fund. In his acceptance speech, Life Itself Steve James thanked his co-editor David E. Simpson, who was sadly unable to travel due to poor weather, along with Producers Zak Piper and Garrett Basch, Executive Producers Kat White, Mark Mitten, Michael Ferro, Justine Nagan, Gordon Quinn, Steve Zallian and Martin Scorsese, co-producers Josh Schollmeyer and Emily Hart, and CNN Films. James also said, "It's arguable I wouldn't have much of a career if it wasn't for Roger Ebert... it was a true honor to be able to tell his story." The Homestretch tells the story of three homeless teenagers who brave Chicago winters, the pressures of high school, and life alone on the streets to build a brighter future. Against all odds, these kids defy stereotypes as they create new, surprising definitions of home. It world premiered at Hot Docs 2014, was released in select theaters in fall 2014 by Kartemquin and on digital via The Orchard, and was broadcast on PBS Independent Lens in April 2015. It is available to watch on DVD and digital platforms. Learn more at www.homestretchdoc.com. Based on his memoir of the same name, Life Itself recounts the surprising and entertaining life of world-renowned film critic and social commentator Roger Ebert – a story that’s by turns personal, wistful, funny, painful, and transcendent. It world premiered at the 2014 Sundance Film Festival, was released in theaters and digital by Magnolia Pictures in July 2014, and was broadcast on CNN in January 2015. The film is available on DVD, Blu-Ray, and Digital. Find out more at www.ebertmovie.com. Life Itself was also Emmy nominated for Best Documentary. (The Life Itself team enjoys the Emmy awards).